Designed to help you build a successful online business. Shopping cart, multi-vendor, auction, classifieds, subscriptions and membership - All-in-One place. Reach, engage and delight more customers with newsletters, auto-responders or campaign management. Help desk solution, contact management and visitor tracking to help you make better decisions. More extraordinary tools to help you get your business started, grow quickly and sell more product. You have a choice when you look for a technology partner. We want to be your partner. We think we're different from others - in a good way. Everything you all need to start and manage your online business—all in one place seamlessly integrated, each extension goes further. Less hassle, and save more money. We take security very seriously. We have developed an in-house tool that avoids any potential vulnerabilities. So far, there have been no vulnerabilities reported. We invested heavily in research and innovation. 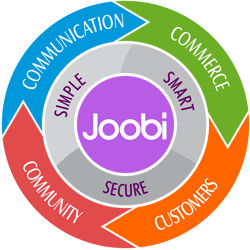 Joobi products supports WordPress and Joomla CMS. Keep an eye on our blog for latest innovation. You can enjoy all Joobi products with our fair pricing starting at $0— designed to help you get started and easily manage your online business.